In the Fall 2011 issue of the PieceWork special issue Knitting Traditions, Maureen McGinnis Patterson shares with us the exquisite sock knitting of her friend Lydia Gladstone in the article, “Lydia Gladstone: Knitting from Ukraine to Oregon,” and the companion project, Lydia’s Stockings. Here’s Maureen with more about how Lydia came to knit such lovely stockings. Lydia [Gladstone] was twelve years old when she went to live in the Klosterschule Niedernburg, located in Passau near the junction of the Inn, Ilz, and Danube rivers. During the five years that Lydia lived there, she was treated with kindness and received an excellent education. The convent had no electricity, and in winter it was cold and dimly lit. The girls spent long dark evenings at their school desks, knitting by candlelight while Mater Prefect read stories from the Lives of the Saints. 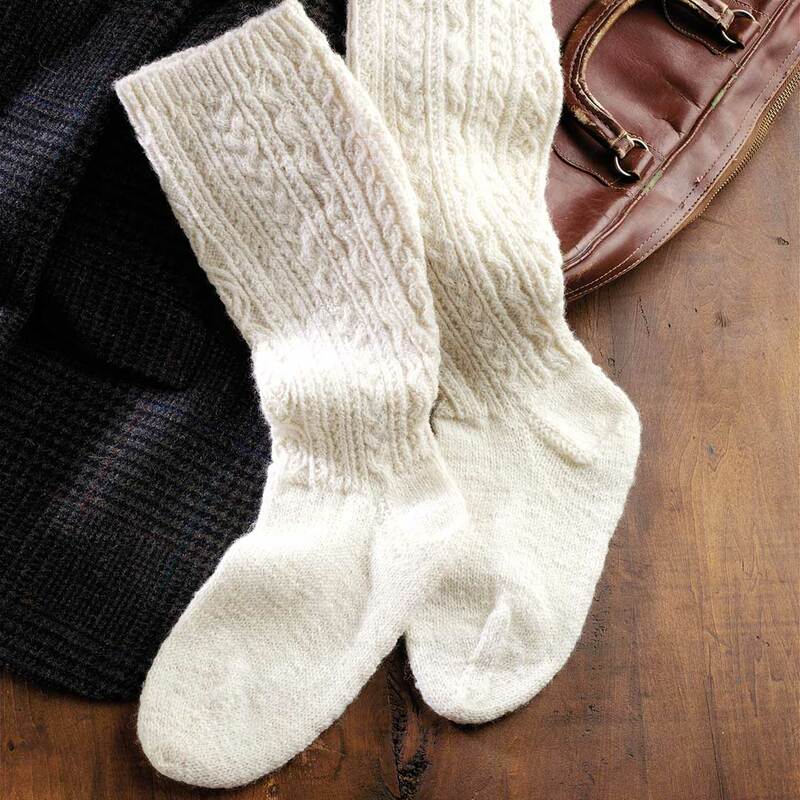 The girls knitted white stockings from lightweight commercial yarn, long, with fitted calves, the ribbed tops resting snugly just below the knees. When I ask whether they used a pattern, Lydia replies, “No, there is no pattern.” She excuses herself and returns with a pair of stockings ornately decorated with fine cables and both twisted and traveling stitches from the ribbing down to the ankle. 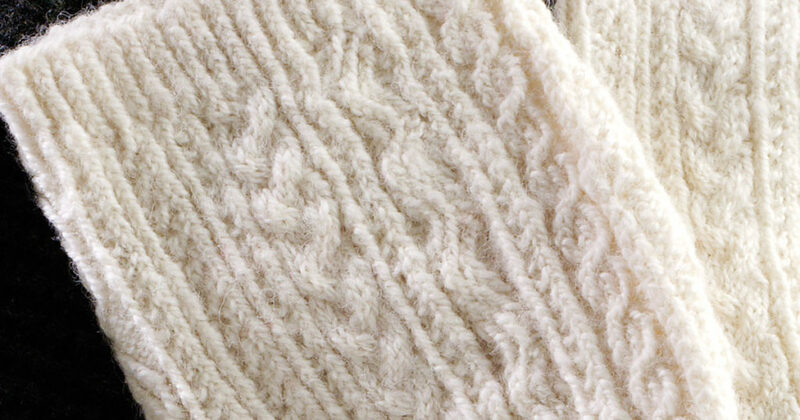 She explains that they are the same as the ones that she knitted as a schoolgirl except that for these she has used her own handspun yarn. I thought again of her description of that chilly room, each girl sitting at a desk lit by a single candle, knitting exquisite stockings like these. The girls needed no written instructions; they memorized the individual stitch patterns as they knitted them; the stitch patterns were handed down from the older girls to the younger ones. 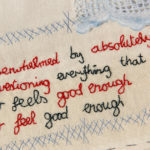 Each stitch pattern had a name, but it also carried a special meaning to the individual using it. To one girl, the pattern named Winding Path might represent the path to her sweetheart’s door. To another, it might be the road leading to a grand adventure. For this pattern, Maureen McGinnis Patterson interpreted Lydia’s stockings as faithfully as possible. Maureen McGinnis Patterson is a retired graphic designer and a lifelong student of textile arts. She loves the historical aspect, but her real passion is building her own tools and developing new techniques. Featured Image: Detail of Maureen McGinnis Patterson’s re-creation of her friend Lydia Gladstone’s stockings, which were knitted as a gift for her husband, Igor, and based on the cabled sock designs that Lydia learned to knit as a schoolgirl at the Niedernburg convent in Passau, Germany. Photos by Joe Coca. Discover a world of sock knitting in PieceWork!